Meeting with alarm and mockery alike, his unusual phrase “very stable genius” went viral. This sense of genius—an exceptionally intelligent or talented person—dates back to the 18th century, according to the Oxford English Dictionary (OED). Drawing on the earlier work of Francis Galton, American psychologist Lewis Terman classified a score above 140 as near genius or genius on his 1916 Stanford-Binet Intelligence Test, historical basis of modern IQ scales. These now use language like very superior or extremely high for scores at or above 130, as genius is tricky to define scientifically. Etymologically, however, it’s a different story. Ancient Romans believed every person had a genius, or a guardian spirit who guided them from birth to death. The male genius was a kind of incarnation of Jupiter, the chief male deity; the female, Juno. Places (genius loci), objects, events, and institutions also had their own genii, as was the plural in Latin, and Romans would propitiate their genii at important moments in their lives. The Latin word genius is ultimately rooted in the verb gignere, “to beget” or “bring about.” We might understand the literal sense of genius, then, as a “generating power” or “inborn nature.” A deeper, more ancient belief in a “procreative divinity,” especially as represented by the male head of a family, may be at work. English’s generate—among many other derivatives ranging from gender to generous to genus—comes from gignere. This verb is rooted in the Proto-Indo-European *gene-, “to give birth,” which supplies everything from the Greek gene and gonad to the Germanic kin and king. Related Latin forms also yield the likes of gentle, genital, and germ, along with less obvious, French-filtered derivatives such as naive, native, nature, noel, and renaissance. English first evidences genius in the late 14th century, as the OED finds, in reference to guardian spirits. These spirits resemble the Christian concept of guardian angels, and indeed, genius was applied in the late 16th century much like the shoulder-sitting angel/devil trope we often see depicted influencing good or bad behavior in modern cartoons. 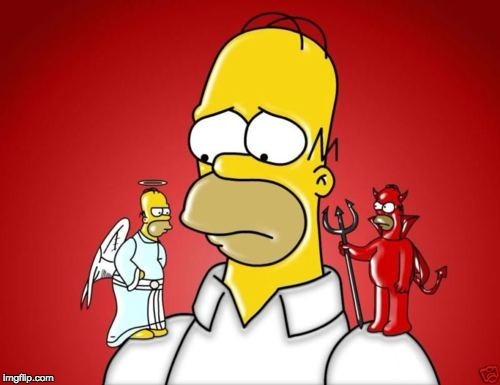 The “good” spirit was sometimes called bonus genius (1606), the bad malus genius (1538)—giving rise to evil genius in the 17th century, originally conceived as a malevolent spirit that tries to make someone do evil. The modern genius starts surfacing in the late 16th century, but the Ancient Romans were already using genius as a metaphor for “inclination” or “talent.” At least by the time of Augustus, they worshipped the genius—a personification of the innate greatness—of emperors. For poesy must not be drawn by the ears, it must be gently led, or rather it must lead; which was partly the cause that made the ancient learned affirm it was a divine gift, and no human skill, since all other knowledges lie ready for any that has strength of wit, a poet no industry can make if his own genius be not carried into it. There is no Character more frequently given to a Writer, than that of being a Genius. I have heard many a little Sonneteer called a fine Genius. As Sidney, Milton, and Addison all suggest, genius was especially applied to poets. While we still say it of great artists, genius today skews towards the mathematical and scientific—Einstein, Hawking—when we are not more generally using it to describe a very smart person or someone who’s quickly solved a particularly thorny problem. In English, as in the French genie and German Genius/Genie, the “talent” senses of genius were likely influenced by the Latin ingenium: “innate quality, nature, character, temperament, talent, intellect,” and so forth. Ingenium supplies ingenious and engine, and its stem shares a parent in genius’s gignere. That French derivative, genie, was used to translate the jinn in The Arabian Nights, owing to its happy resemblance in sound and, to some extent, sense. Genius hasn’t exactly proven itself a “very stable” word, as Trump’s understanding of genius shows just how far the word has come from its Roman roots. But the two—if we look to that primeval virility implied in genius and Trump’s own machismo—might yet have more in common than we’d think. I like te information about the word genius, but every single thing Trump tweets is gross & disgusting & makes my skin want to crawl. I don’t know if it’s bc I’ve been sick for awhile for real but I’d rather spend all day talking to Gustav’s 6 y.o daughter, Heidi, than look at one thing TRUMP says. She talks abt her Papa having a big bed & her doll & a whole host of other things and all of it seems positive at least; maybe it’s just bc she’s so happy while she’s talking. She goes talking on so fast I can’t always follow her; she speaks only German. I can’t believe listening to a child talk lifts my spirits way more than looking at anything he says.